It was a pleasant trip this time back to hometown (a small 'kampong' [village] in Tanjong Karang). But I'm not going to talk about Tanjong Karang; I'm going to tell you information that you need if you are going to Kuala Selangor. YES, I'm going to tell you about Kuala Selangor. Of course not all the facts but just quick 3 information that you definitely don't wanna miss if you going there. I know when people heard about Kuala Selangor, the first thing they will say is "oh, the 'kelip-kelip' [fireflies]". Yeah, you can see fireflies in Kuala Selangor. You have to be ready for this little adventure. First, it's going to be very dark that you can't see each other. And next you can't speak or talk to each other when you're in the boat. This is to make sure you won't scare away fireflies. Be prepared for mosquito's attack. To prevent this, please wear long sleeve-shirt and jeans if possible. Sound scary right? Hmm, it depends who. Personally, I saw fireflies before (not as many as supposed) so it's not something that I love. Maybe for traveler, should at least look at it. One more thing I must warn you that recently CROCODILE appeared in surrounding of fireflies spot. Visitor experienced the boat shaking, that crocodile's tail 'slap' the boat. Fortunately everyone was safe. Don't hesitate with what I just said, because this is confidential info from local people. Until now at today (19-11-2011), they still failed to capture the crocodile. Seafood comes 2nd topic when people talking about Kuala Selangor. 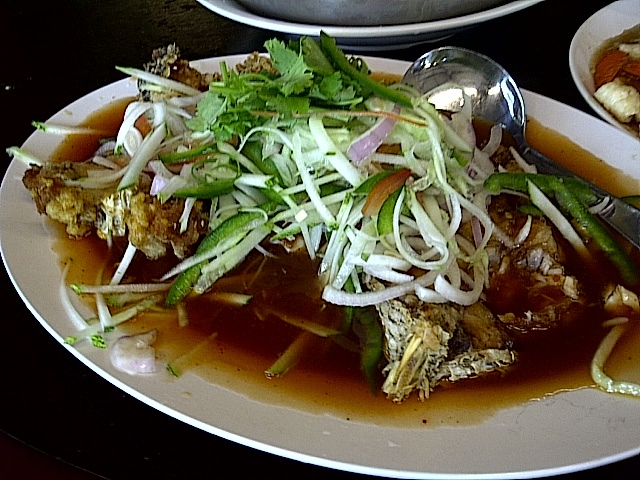 I don't know much about seafood restaurants in Kuala Selangor. But there are TWO seafood restaurant that you might want to try. 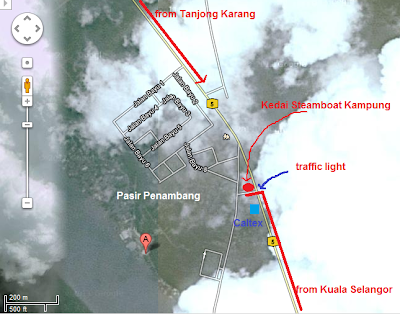 One in the Jetty, one is in the traffic junction of turning into Pasir Penambang. Well, I will intro you the one in traffic junction turning point. If you are searching the keyword 'Seafood' you probably couldn't find it because it is a steamboat restaurant but + seafood. It is very easy to find it. If you're from coming from Kuala Selangor, you will definitely pass by a bridge. After the bridge drive for less than a minute, you will see a Caltex petrol station on your left, follow by a traffic light. You'll need to turn left in the traffic light junction, immediately you will see the restaurant. Simply park your car on the road side and then you're ready to order seafood. This seafood restaurant is our village people all time favorite. Their crabs, scallops, fishes and prawns are freshly captured in local market. I'm not sure they have a menu for you to order in case you don't know what to order or how you want the seafood to be done. But just to tell you that they're speaking Hokkien and Mandarin. 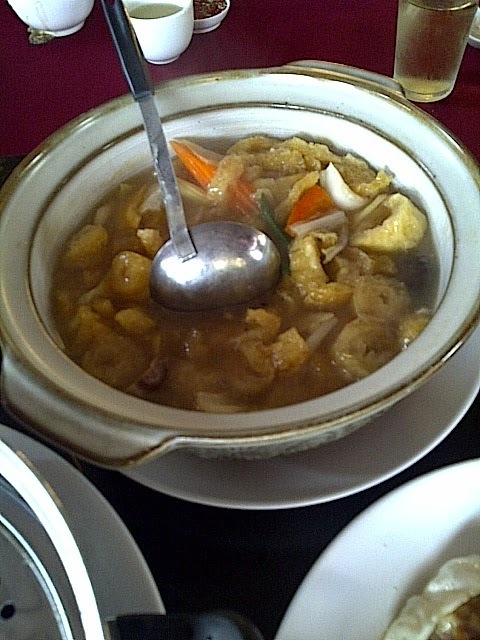 I actually try to remember the name of the dishes but my memory is not good as a CPU memory. Eating seafood is one of the routine when I back in hometown. Steamed prawns. 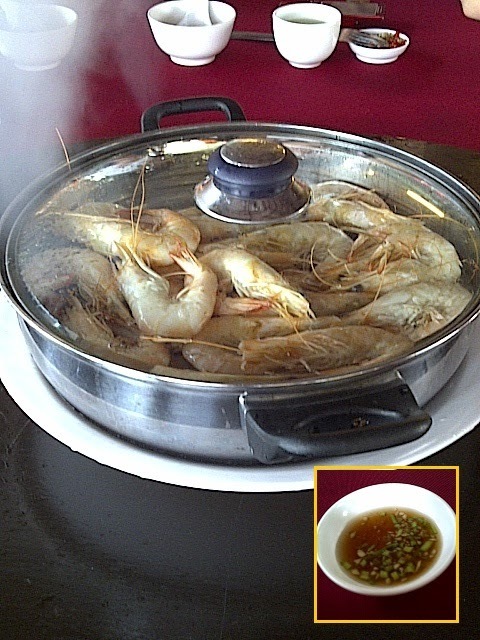 This one is steamed and when the boss delivered it to the table, the smoke can be seen and waited a while he came back with a cup of soft of alcohol drink and scatter it all over the prawns, then only we start to eat. You have to taste it with the sauce. It was good. 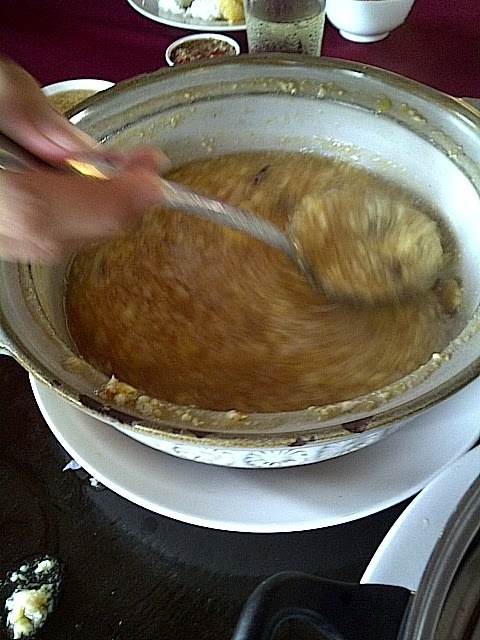 Well, I have no idea what is the name of this but you can always see it if you going to a Chinese wedding dinner. It is a must dish for every Chinese wedding dinner. Oh I love this. First time tasted it. 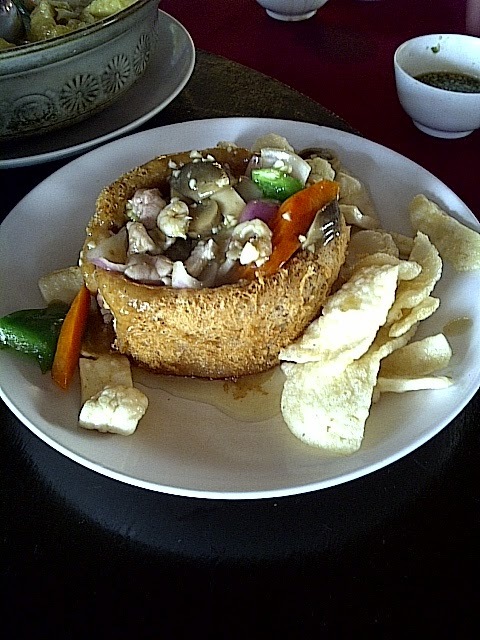 It has taufu, eggs, mushroom, crab meats and little prawns. 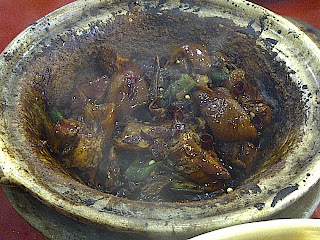 Some people like most Hokkien, they love chicken feet. Well I had once took it and it was okay. However I just picturing myself biting and chewing the dirty chicken bare feet. Hahaha. Disguting isn't it? Well, go and taste it. Sister asked for a snap :) Beautiful isn't she? 2nd brother of my mom, my uncle's son got straight As in his SPM and he got few thousands as reward so he bought us seafood this time. Do you think it's cheap? Well, It is DAMN cheap. No wonder people drive all the way from KL to KS (Kuala Selangor) just to have a seafood dinner. NOTE: Kedai Steamboat Kampung only accept cash. No credit card. So that's for dinner. One last thing about Kuala Selangor that you might get is their famous local made "Kelopok Udang". One tip is, do not buy "Kelopok Udang" from Kedai Steamboat Kampung there. Because there is a van on the roadside, selling "Kelopok Udang" as well but it is not the famous one. The different you can tell is from the packaging. The name is Yeu Hock (有福). The shop is just down the road. So after you turn left in the traffic light, Kedai Steamboat Kampung is at your right, immediately you come to a junction. Take the left turn again, go straight and keep your eyes on the left side shop-lots. 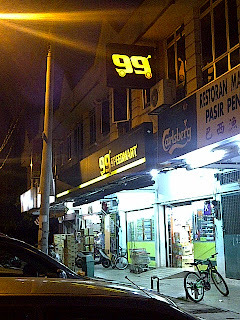 Try to search for the shop or you can see 99 mart. Yeu Hock shop is just 2 store away from 99 Mart. 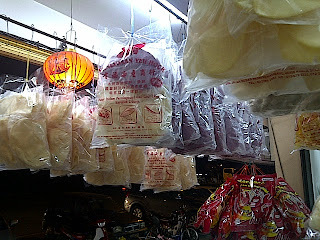 This is Yeu Hock shop, selling all kind of seafood stuff. "Kelopok Udang" hanging high in the shop. 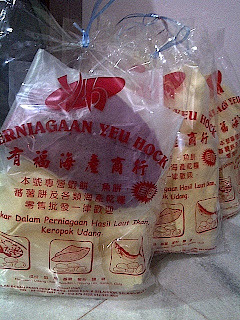 I decided to get something from hometown, for my colleagues. "Kelopok" is the most suitable souvenir from Kuala Selangor. Hehehe. At night I went to visit my best girl friend. Thank God she finally got her wish - get pregnant. It's already 6 months after marry. 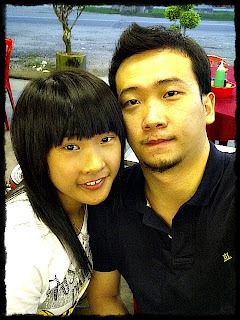 I was still feeling guilty and missing something that I didn't attend her most important day - wedding dinner. I was excited too when I got the news from my sister. It was difficult for her to get this one. She was hospitalized for the first 4 months of pregnancy due to some reason. Now that she is okay and expecting delivery in March 2012. I'm going to be a Godfather! I had a great talk with her and her family. We talked about traveling, recent update of our life, and some gossips. Usually whenever I go back hometown, we will meet for chat. Everytime we hang out, we feel older as time pass by. For the last 5-6 years she been talking about no one will like her or getting marry. Now that she is married and going to have baby. I know already that our next conversation will be all about feeding the baby. Kekeke. She's is the conservative type of woman. She decided to follow the normal life that 99.9% of the village population lived with and I am always the opposite. I will pray for you and my (your) baby. Kekeke. Around 10pm my mom called me for supper. 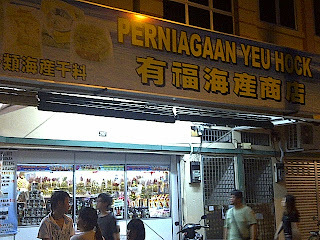 Every single time I go back, one of the MUST-do is having Loh Mee as supper! 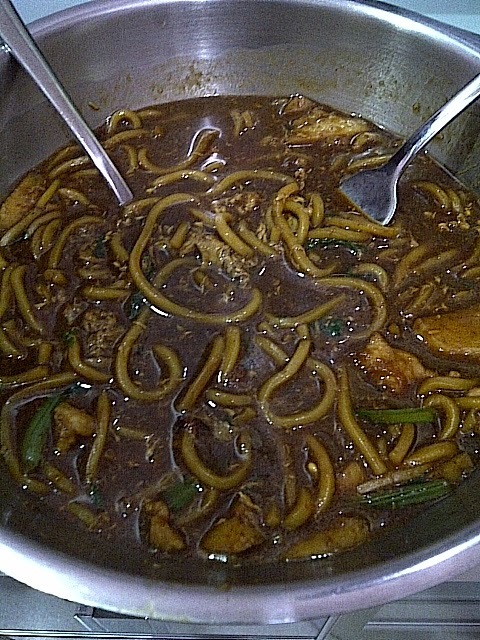 I still can't find the same taste of Loh Mee in Kuala Lumpur/Petaling Jaya. 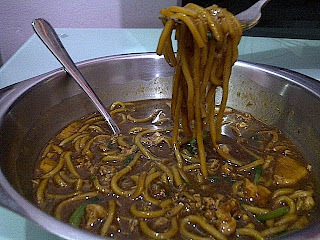 This Loh Mee is the BEST Loh Mee in my list! 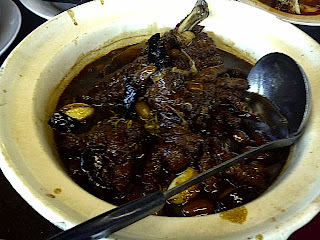 The next morning, Sunday, as one of the routine for eating, Bak Kut Teh with family including 2nd aunt & grandma for breakfast. It was quite late in the morning around 10 o'clock. 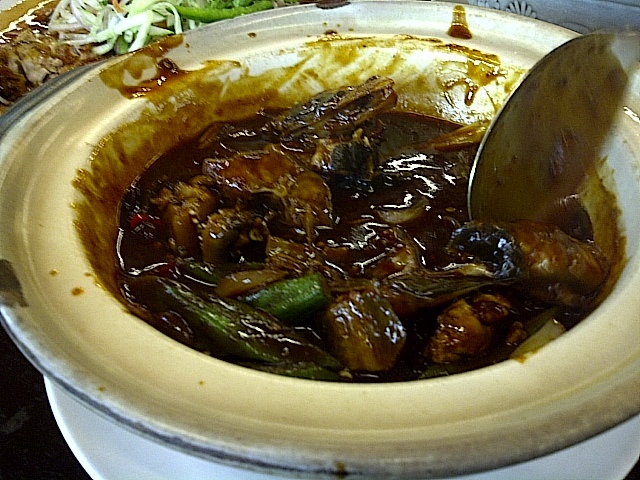 This Bak Kut Teh restaurant got famous history. I think I've mentioned it in my blog (you can try search "Bak Kut Teh" in my blog search engine on the top page) before that the kid of 14yo mastering cooking of Bak Kut Teh from his father and was published in one of the local newspaper. Now that they have branch in Puchong. Back in Tanjong Karang is, considered 'HQ' now. Kekeke. 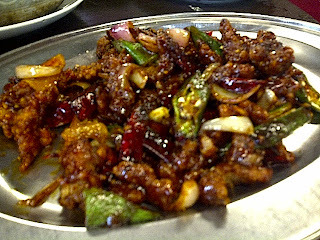 This is dry one with chili. My sister's favorite! 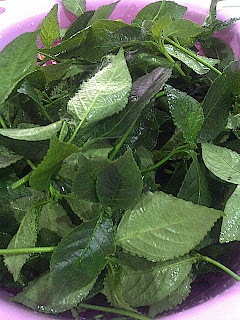 One last thing that I will do at hometown is to drink herb. Well I still don't know what is the name for this leaves. Anyone of you know the name? The function is like pennywort (daun pegaga), to cleansing your body. Please do drop me a comment if you know okay? I need to know. So, there was this amazing mother-son story behind this. 20 years ago, Grandma desperately looking for this herb. The son (my uncle) was diagnosed with Hepatitis B. She went alone with determination searching for the herb to Ketam Island (Pulau Ketam) That time still no bridge connect from mainland to Ketam Island ('Ketam' in English means 'Crab') but only with small boat. In the island, for those who has it, they didn't want to share because it was priceless and rare species and they keep it for themselves. Grandma did not give up and went on searching. God blessed her for her unconditional love to the son, eventually she found it and brought home. Since then she passionately planting this herb until now in the house's backyard. According to my mom, the herb leaves are looking pretty and healthy. Beautiful! And I've been drinking it every time I go back hometown or when my family visit me in KL. Of course she always remember to make one more for my partner. Listening to the story, I was quite touched. Surprisingly I was being very patient, listening to my mom. Usually I don't bother, but this trip coming back hometown, I was like another person. Patient, pay attention to conversation with whoever, very participated and very an adviser. Kekeke. Not that I know a lot of things. In fact, I know little thing. Traveling really make me a better person. 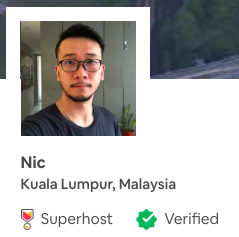 Of course when talking about traveling, my partner is the one I should thank to. Special thanks to Stanley & his partner too. I've learnt a lot from them in my U.A.E trip. Every moment you spending with family and friend is invaluable. Life is short, don't waste it while you have the time. Well, that's all the food I enjoy back in hometown. Good night and hope you have a wonderful week. Hi..I am planning to go to Kuala Selangor for a day trip. Saw you blog with some informative about the food over there. 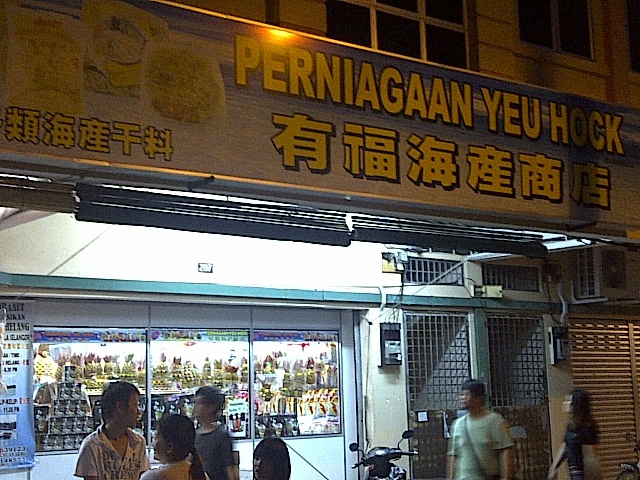 I am interested to try-out the Loh Mee you mentioned. Unfortunately, you didn't tell where is the location? Can you let us know? 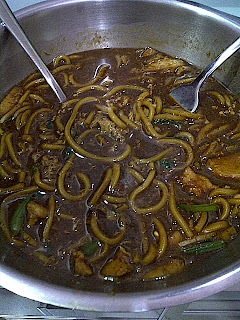 I'm so sorry to tell you that my Loh Mee is only available in my kampung and only at night. Anyway, where is this Bak Kut Teh that you mentioned? Looks delicious! 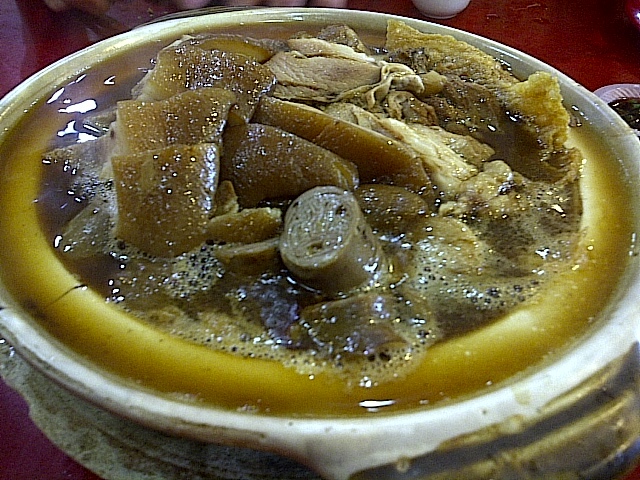 The Bak Kut Teh restaurant is located in Tanjong Karang town. Make sure you know what you want to order...haha. I mean from the variety of pork meat/bone meat. Wah.. you super nice! Even created a map! I won't be able to go so soon, next time maybe... Kuala Selangor is a very place. I won't mind driving from KL to visit the place again. There's too man BKT in KL and Klang, so maybe I won't even get the chance! Puchong branch maybe? I passed by Tanjong Karang on the way to Sekinchan, and even filled my petrol there. Nice town! What's the name of the BKT shop?